Toyota's first foray into the American pickup truck market was the Stout, introduced in 1964. Five years later, a new version carrying the Japanese name, Hi-Lux, was brought out; after just a year it gained a new, smaller (1.8 liter), but more powerful engine which was used for two years before being replaced by a larger (2 liter) version. In 1973, the Hi-Lux gained a long bed version, and the engine was expanded again, to 2.2 liters, and a five-speed manual transmission became available, replacing the four-speed. Through the early 1980s, the Hi-Lux used a solid-axle front and rear suspension, with rear leaf springs. In 1975, the SR-5 Sport Truck brought a five speed manual transmission; sales exceeded Toyota’s expectations, with 2,610 units sold from January through April 1975. Around 85% of Toyota standard-bed pickups bought the five-speed, which was unique to Toyota (that is, the SR5 was the only mini-pickup in America to have a five-speed overdrive transmission). Features on this truck included soft-vinyl high-back bucket seats, AM radio, carpet, tinted glass, body stripes, radial tires, power disc front brakes, and the new 20R 2.2 liter engine. In 1976, the name Hi-Lux was dropped in the US, and it became the “compact truck” or “pickup” until the Tacoma appeared. The 1976 line was diverse enough for Toyota to claim they had the biggest selection of small pickups of all manufacturers in the United States. Power front disc brakes were standard, and two over-seven-foot-long beds were available along with standard beds. The Long Bed SR-5 Sport Truck included a five-speed overdrive manual transmission. In 1979, the spartan interior was given much more in the way of comfort; a four wheel drive model was also brought out (it had a four-speed manual rather than the usual five-speed). Engine choices changed again in 1981, with the 2.4 liter 22R engine and a new 2.2 liter diesel. In 1983, Toyota bragged about a “hefty 1,400 lb payload, a roomy cab, and ... the convenience of a wide bench seat that is equipped with three sets of seat belts and easily accommodates three adults.” They also noted the largest standard engine in the small two-wheel-drive truck class — not necessarily the most powerful — and the availability of the Diesel Deluxe and Diesel Sport trucks, the former having a long bed, the latter having the SR5 package. In a jab at GM’s unsuccessful gasoline-to-diesel conversion engine, they noted the Toyota mill was “built from step one to be diesel-tough — not just a modified gasoline engine.” On the heavier side, they pointed to a 3/4 ton truck that can carry 1,800 lb, as well as unfinished camper and commercial cab/chassis. The SR5 Sport Trucks and camper-grade chassis cabs had reclining bucket seats. The SR5 Sport Trucks also had full floor carpeting and an upgraded carpeted back panel across the back of the cab to reduce noise. A full fourteen models were available in 1983; most had either a four or five speed manual transmission, while the half-ton deluxe and Long Bed SR5 Sport could get a new four speed automatic with overdrive, which was quite rare at the time, most manufacturers using only three speeds. The five-speed overdrive manual was standard on all Deluxe and SR5 Sport models. The 2.4 liter gas engine gained fuel injection, increasing its power. All rear drive models used a front suspension with double control arms, torsion bar, and sway bar (omitted on diesels); the rear suspension was a conventional live axle on leaf springs, with a softer ride on SR5. Four wheel drive models used a live axle on leaf springs in front and back, with a front stabilizer bar. All models had power assisted front and rear brakes, with discs up front (ventilated on cab/chassis) and drum in back. Differential ratio was 4.1:1 on four wheel drive models and chassis cabs; 3.417:1 on standard and long bed pickups; 3.909:1 on diesels, and 3.727:1 on all others. Cruise control, previously available only on the rear-drive SR5 five-speed models, was now optional on the Long Bed SR5 with the automatic transmission. A large array of options included cloth seats (4x2 Deluxe and SR5), AM/FM/MPX electronic receiver and moonroof (SR5 only), sliding rear window and side vent windows (all but Standard grade and Chassis Cabs), and 205/70R14 tires on six-inch-wide wheels with power steering (4x2 SR5). Black package options were available on SR5, including the FM receiver, sliding rear and side vent windows, tilt wheel, power steering, black paint, and chrome front bumper. The 4x2 also got the aforementioned big tires and wheels with cloth seats; the 4x4 included radials, chrome wheels, and chrome grille. Across the board, 1983 trucks were given a new rear appearance, with the Toyota logo on the tailgate changed in color to match the striples on monotone SR5 trucks, and with the lower body color on two-toned SR5s. Models included the standard bed, long bed deluxe diesel, SR5 sport, long bed, long bed deluxe, SR5 long bed deluxe, long bed SR5 sport diesel, 3/4 ton, commercial cab/chassis, and camper cab/chassis. The diesel engine was not available with the long bed. * Horsepower - California: 96 horsepower. Other specs for rear drive include width (63.4 inches), tread (53.1 inches), legroom (40.4 inches), headroom (38 inches), cargo load (1,400 except 1,800 lb on 3/4 tons; includes two passengers, cargo, and equipment). For four wheel drive, width (66.5 inches), tread (max 55.9 inches), legroom (40.4 inches), headroom (38 inches), and cargo load (1,400 including two passengers, cargo, and equipment). A shift-on-the-fly four wheel drive system, allowing front hubs to be locked from within the truck, appeared in 1984, on the fifth generation. Across the board, this generation had more comfort changes, an Xtracab with storage space behind the seats, and turbocharged versions of both the gas and diesel engine; the diesels would be dropped in 1988. The turbocharger was fairly low-pressure; in 1987, it boosted power from 116 to just 135 horsepower at 4,800 rpm. 1984 also brought had an independent front suspension (a double-wishbone, torsion-bar type) which helped ride and cornering, and made a V6 version possible - but it did not appear until 1988, with the sixth generation. The V6 let the compact truck tow 3,500 pounds. In 1985, a four-speed electronically-controlled automatic transmission became available. In 1987, Toyota found that its owners were the most loyal (based on Ward’s reports) and most satisfied (based on J.D. Power). At that time, a wide variety of options were available, with standard and long beds, Standard, Deluxe, and SR5 trim levels, regular and XtraCab, and the 1-ton truck, with the highest payload capacity of any compact or midsized pickup - 2,655 pounds. Towing capacity on all trucks was 3,500 pounds when properly equipped; the one-ton could tow 5,000 pounds when properly equipped. 4x4 versions were also sold, again with a five-speed manual or four-speed automatic. While the compact truck sold moderately well, it never approached the sales of the Chevy S-10 or Ford Ranger. 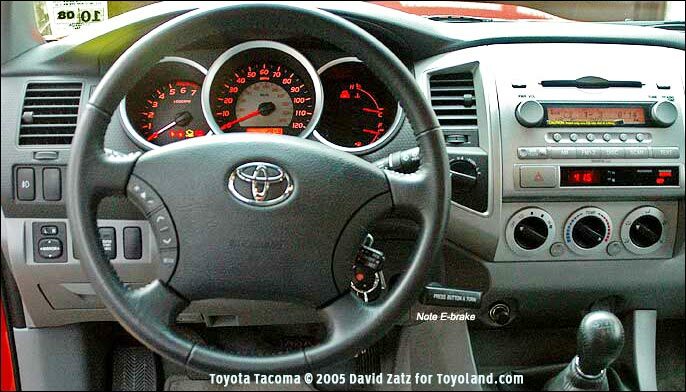 In 1995, Toyota hoped to change that with a new model designed and built in the United States — at the NUMMI plant in California which also makes Corollas, and is known for both employee involvement and high quality. The term Tacoma comes from an Indian word for Mount Rainier and was chosen for the image it evokes. The Tacoma had the high performance engines Americans liked, including a 142 horse four with 160 lb-ft of torqueand a 150 horsepower 2.7 liter four with 177 lb-ft of torque. The optional 3.4 liter V6 pumped out 190 hp and a truck-like 220 lb-ft of torque. The new suspension used a coil spring double-wishbone configuration. Suspension travel on the four wheel drive models increased from by nearly two inches to 7.7 inches for better comfort and off-road performance. The old leaf rear suspension was kept with minor changes. Two years after its launch, that is in 1987, Tacoma four wheel drive models gained a locking rear differential for better off-road capability, and bucket seats on non-SR5 level Xtracabs. 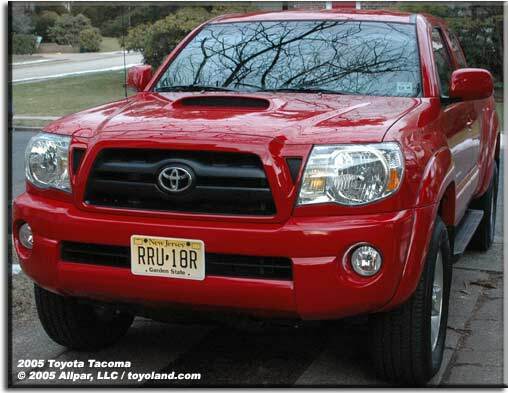 In 1999, a Tacoma PreRunner was introduced, mimicking the four wheel drive model but with two wheel drive. The StepSide appeared in 2000, the four-door DoubleCab and S-Runner in 2001. The term “prerunner” is used in off-road rallies to describe a truck that “pre-runs” the course - the racing truck itself is not used to prevent undue wear. Prerunners are often modified two wheel drive models to save money. The 2000 model year also saw the addition of the Tacoma StepSide, a sporty stepside package that added a youthful alternative to the Tacoma lineup. Stability control and traction control became standard on four wheel drive and PreRunners in 2004. The Tacoma was an unquestionable success, partly because it was aimed at the US market, and partly because it had an enviable quality record. For example, from January to April 2005, the Toyota sold over 49,000 Tacomas, while the newly redesigned Chevrolet Colorado, the next best-selling small/medium pickup, only sold 45,000 copies. The Ranger and Dakota both had less than 40,000 sales, and the newly redesigned Nissan Frontier only had 24,000 sales over those four months. Given the statistics below, the Tacoma's success is not surprising. Some owners have found water on the carpet in front; the problem is usually caused by a small leak in the lower part of the cowl seam. It can be fixed using standard seam sealer, or the dealer can take care of it under warranty (in about 2 hours). Some 2004-2005 models may have a sulfur smell during stop and go driving or hard acceleration; the dealer can fix this during the warranty period by replacing the catalytic converter and upgrading the computer. The grease cap should pry off. Carefully pry with screwdriver or use a pair of channel lock pliers and worh it slowly back and forth until it comes out. You just tap the grease cap back in place to replace it. Make sure you do not forget to clean and repack the bearings and install new grease seals on the rear of rotor. Run out is the amount of movement from top to bottom of rotor as you spin it. It is measured from a perpendicular imaginary line to see if the rotor is running in a true pattern or if one part is not as true as another. A number of older Tacomas have been “upgraded” with Supra engines; the inline six is rather big for the engine bay, and mating the transmission to the differential is difficult, requiring fabrication and adjustments, but it’s been done to get the extra power. Proceed at your own risk as with any upgrades/repairs.